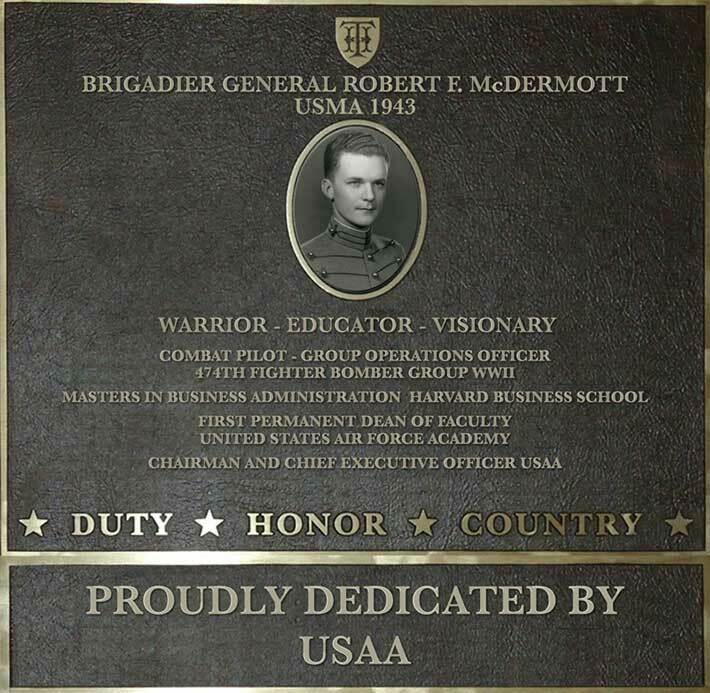 Brigadier General Robert McDermott was a pioneer in many ways in aviation, education and in finance. He was a World War II fighter pilot, served as the first Dean of the US Air Force Academy, and then led USAA as the Chairman and CEO. Robert McDermott was born July 31, 1920. He graduated from Boston Latin School, then attended Norwich University prior to being admitted to West Point in 1939. In the early years of World War II, his class graduated early in January 1943 (the original class of 1943 graduated in January, the original class of 1944 graduated in June 1943). He attended flight school and flew combat missions as a P-38 pilot with sixty-one combat missions in the European Theater of Operations and then served as operations officer of a fighter-bomber group. In 1954 he was assigned as an Economics Professor and Vice Dean of the Faculty at the newly formed Air Force Academy in Colorado Springs. He was selected by President Eisenhower (USMA 1915) to become the first permanent professor at the newly formed Air Force Academy in 1957, and then as the first Dean of the Academic Board of the United States Air Force Academy in 1959. At the time of his promotion to Brigadier General in 1959 he was the youngest general officer in any service at age 39. He is one of the thought leaders in military education, introducing many "firsts" into military education and served in that role for 18 years. He wrote regularly about personal finances for military officers and airmen and was identified as a thoughtful financial mind by the leader of USAA, the largest provider of financial services to military personnel. He retired from active duty in 1968 after a twenty-five year military career and then served twenty-five years as the President and CEO of United States Automobile Association (USAA). Under his leadership USAA rose from 16th to the 5th largest provider of automobile insurance and the 4th largest provider of homeowner's insurance. His contributions to West Point, the US Air Force Academy and the City of San Antonio have been recognized with numerous awards from each for his selfless service and extraordinary leadership. His military decorations include the Army Distinguished Service Medal, Air Force Distinguished Service Medal, Bronze Star, and six Air Medals.